Integrative Breathing Therapy (IBT) is a comprehensive and evidence based approach to breathing retraining and breathing therapy. It aims to optimizes the function of the airway by training nasal breathing, correct posture and improving muscle function. by teaching you to breathe in ways that are more efficient, functional, relaxed and mindful. The assessment identifies the nature and extent of breathing and airway dysfunctions. It also looks for factors that are causing or perpetuating the breathing dysfunction. The treatment plan might include recommendation for breathing exercises, muscle and postural rehabilitation exercises, relaxation and mindfulness techniques, orofacial myology and sometimes manual therapy. When necessary, it might also involve recommendation to see another type of medical or health professional. Where it’s appropriate and potentially helpful, individuals are invited to begin one of the structured Integrative Breathing Therapy programs. These are available as individual sessions or small group workshops. Research suggests that how we breathe influences the function of a number of body systems. This does not mean that breathing training is the answer to all health problems, but it does suggest that it has a role to play in improving our health. The following list is a summary of some of the potential impacts of breathing. Breathing can influence the function of the autonomic nervous system and the vagus nerve. Breathing exercises can calm the stress response and improve stress resilience. Breathing exercises can influence the immune system and the inflammatory response. Breathing helps normalise homeostatic reflexes such as the baroreflex (that regulates blood pressure). Breathing can be used to train the mind, focus and attention. Breathing affects the function of the digestive system. 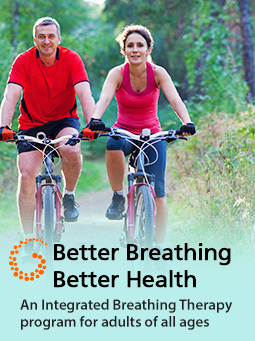 Breathing exercises can improve airway and lung function. The breathing basics protocol is a breathing, posture and movement routine. It helps to correct the function of the diaphragm and trains you to co-ordinates the function of breathing muscles so that you breathe more efficiently during the activities of daily living and in times of stress or challenge. This breathing technique adjusts rate, depth and rhythm of breathing to create an ideal interaction (resonance) between the respiratory, cardiovascular and autonomic nervous systems. It is a particularly good breathing technique for improving vagus nerve function. Resonance frequency breathing involves relaxed diaphragmatic breathing at around 3-7 breaths per minute. Research has shown that regular practice of resonance frequency breathing helps people with a range of conditions including asthma, COPD, hypertension, heart disease, fibromyalgia, depression and anxiety. Mindful breath and movement techniques used in IBT are an important part of the program, particularly for individuals with stress related breathing dysfunction and lots of breathing symptoms. For these people focusing on their breathing can be unpleasant and attempts to directly control and modify breathing can lead to increased tension and distress. 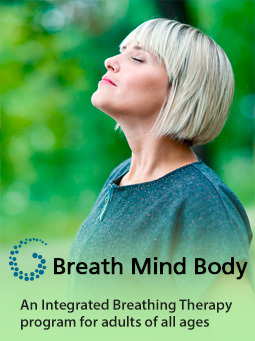 The IBT mindful breath and movement techniques teach people to relax tense breathing muscles, to appreciate pleasant body sensations and to become more tolerant and less fearful of breathing discomfort and other symptoms. This can help to reduce symptoms and improve conscious and unconscious breathing control. The Buteyko Breathing Technique (BBT) was originally developed by Dr. KP Buteyko as part of an overall approach to reducing hyperventilation tendencies and mouth breathing in people with respiratory illness. At least 6 published randomised controlled clinical trials have shown BBT to be helpful for asthma. It is also used to help people with sleep apnea and mouth breathing. Dr Courtney runs information sessions regularly for adults and parents about various aspects of breathing. Most sessions run for 1-1½ hours. See the Talks menu tab for upcoming topics and dates. After assessment you can arrange for individual therapy sessions or book into one of the group program classes. 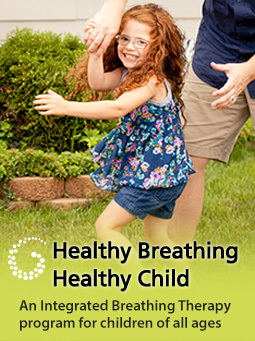 Please feel free to contact Dr Courtney with any questions about how Integrative Breathing Therapy could help you or your child.